Have you always been a radio duo? How did you get started? 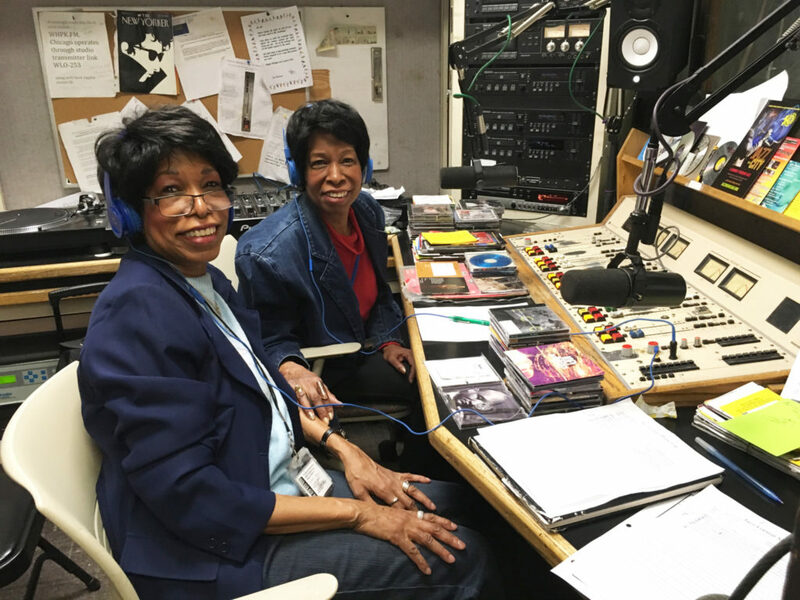 Linda: Only instead of “Journey into Jazz with Brenda” it was “Journey into Jazz with the Twins,” and we called it “Brenda Linda, Linda Brenda.” But I always say Brenda’s name first, since she was on the air before I came on. Brenda: And plus, B comes before L.
Linda: I didn’t think about that. Linda: My father was a gospel singer and my mom was a gospel singer too, but she loved jazz, and she loved classical jazz. She used to listen to people like Sarah Vaughan, Dean Martin, Frank Sinatra, stuff like that. Brenda: She was a big Frank Sinatra fan. Linda: And when she put her music on, it played all over the house. So whatever you were playing, you better go in your room. We didn’t like the music back then because we were young and we were into Diana Ross and the Supremes and blah, blah, blah. I didn’t really like jazz, but I didn’t know that it was vast. All this jazz that’s out here, they don’t all sound the same. So that’s what made me start liking it, when I found out that all of it wasn’t about people who died, and people back in the day. There’s new jazz out here, there’s Latin jazz, there’s—well, people don’t like to say Latin jazz. Brenda: That’s what Sanchez used to do, Latin jazz—we would do that from 1 to 2pm. So noon to 1pm we would do straight ahead, and 1 to 2pm it would be Latin jazz. Linda: And so I usually say instead of Latin jazz, I say Mexican jazz, Cuban jazz, or Puerto Rican jazz. I just say what they are, Argentinian jazz or something, unless they’re all fused together. How do the two of you decide what music to play? Brenda: Well, we know we have to do straight ahead. But Linda’s started liking other types of music, and I eventually started liking them too. Like the jazz-funk. She plays a lot of Latin jazz, which I don’t, but I’m learning to like a lot of it. I learned to like a lot of it when I was with Sanchez, but because I don’t have a lot of it, I don’t play it. But Linda, she added that in. That’s what made the show more interesting. Linda: That’s because I travel around every year in the Caribbean on the jazz cruises and stuff like that. And it introduces me to other styles of music that’s jazz, to other nationalities that do jazz, compose jazz, write jazz. And then I get a chance on the ship to sit down and actually talk to them personally, like I’m talking to you now, and I get a chance to ask them questions about the type of jazz that they play. So then they explain it to me and I try my best to understand it, and when I don’t understand, I ask. That’s why I don’t call that jazz ‘Latin jazz’ anymore, because one of the entertainers, Arturo Sandoval, told me, “stop saying Latin jazz. If it’s Cuban jazz it’s Cuban jazz, if it’s Mexican jazz it’s Mexican jazz, if it’s Puerto Rican jazz it’s Puerto Rican jazz.” I haven’t said it again since. So then I listen to Houston Person, the Clayton brothers, the Cookers—you know, there’s so much jazz out there that I didn’t know was jazz. And so I said, well, I like all of it and I’m going to play what I like. I have to play what I like, what moves me when I listen to it. Brenda: And that’s what I do too—it happens to be different sometimes. Linda: And when I choose my music, I look to see who’s performing in the next week, or who just performed somewhere, and then I play new stuff that I got that I haven’t heard yet. I try to alternate them so I don’t play the same thing all the time and what I’ve played already, I won’t play that no more until I get through playing everything else. So, it’ll be a long time before I get back to that again, because we’re only on the air on Sundays for two hours and it goes by very, very, very, very fast. Brenda: Now, you are the first one to interview us as twins. There’s never been twins in jazz together. Never. Linda: There’s never been a set of jazz twins on the radio, period. Especially on the same show. Brenda: Not just jazz—any kind of music. Linda: So you’re fortunate, because you’re the first one that gets to do this. WHPK is an all-volunteer station. Has it ever been a problem for you volunteering? Brenda: No. As a matter of fact, I started going places so people could know about WHPK. A lot of people didn’t know about us, because the DJs didn’t go anywhere. Brenda: So I started going everywhere, and I had Linda going downtown and to the North Side. I went downtown and to the South Side. So that way more people found out about what we do. They didn’t even know the station existed. Linda: You have to get out there and spread the word. And since I am a promoter of jazz, I go around passing flyers to different events. This was one of them. I took a lot of our little cards around with us with our schedules, and we had that at first. Who’s your favorite musician and what do you like about them? Brenda: I like Gene Ammons because when I first started, Coop gave me ten CDs and that was the first one, and I fell in love with it. I owed him the money, and I paid him the money, but he got me started—Coop’s Records on 87th Street. And then there’s Sonny Stitt. But as far as vocals: Nancy Wilson. And then Frank Sinatra as far as the males are concerned. But I love organs: Jimmy McGriff. Linda: So she’s got a lot of them. And me, my favorite—male—is Freddy Cole because he’s history. He goes back a long way and he’s history, and I met him and he’s a very nice man. And then for females, I’m going to say Cassandra Wilson because she’s different. When you hear her, you can’t say, “I hear her everywhere.” You know, that kind of music and the way she does it, it’s so natural. And the message that she tries to portray when she does her music, it’s different. It’s based on her experiences worldwide and it’s so different, and so adventurous, it puts me in her place. I can kind of see it. The more I know about my artists, the artists that I play—that’s why I read all my liner notes—the more I learn about the artists, the more I try to decipher, try to feel what they were feeling when they made that song, when they chose that selection or the name of it and stuff like that. I even ask them when I see them. Why did you name that that? Why did you name that CD that, you know, this kind of thing. How has the station changed over the years since you’ve been here? Especially in the way it’s related to the University of Chicago. Brenda: First of all, the older ones are not coming anymore. The DJs are much younger now, and the music is more diverse. And a lot of people in the university don’t even know we exist, and they work here, so I’m trying to get them to realize that the station is here. But most people who work here don’t know it. Linda: Well, it’s changed over the years: first of all, the music and DJs like me who come in here saying, you know, “don’t tell me what I can’t play.” “You can’t play Spanish jazz because so and so does that”—I’m going to play what I like and that’s the way it’s supposed to be. I’m going to play what I feel on the inside and what I feel that the audience would want to hear me play. I want to play something that’s going to make people at home—even if they’re in a wheelchair—that’s going to make them want to get up and dance. You know, if you can’t get up it will make you want to. Brenda: This is why I chose these hours. I used to be on from noon to 2pm, and when I first got my own show it was 4pm to 6pm, but I chose these hours, 2pm to 4pm, because I wanted to reach the women coming home from church. Linda: And as far as the university, they need to become more involved in what we’re doing. Because anything the university does, we advertise it. They need to become more involved and support us more in what we’re doing. There’s no reason why they can’t support us more, and they’re not doing that. The administration, they need to join us, help us out, because we do need the help. I think this is a team effort. We need everyone involved, and they could be more involved. Kyle Oleksiuk is a staff writer for the Weekly and a student at the University of Chicago. He last wrote about The Charles Heath Quartet at Room 43.